Mascot Cluster is a complete, turn-key solution for high throughput protein identification. Mascot has been designed to be embarrassingly parallel, which means that each search can be divided to run in parallel on multiple processors. Support for parallel execution is built-in to Mascot, and does not require any special operating system or grid engine. If you wish, you can license the software and set up a cluster using your own hardware. On this page, we describe the other option: a turn-key system with Mascot pre-installed on reliable, high performance IBM hardware. Any current IBM server that uses Intel or AMD processors can be used as the hardware platform. For a small cluster, up to around 6 processors, the most cost-effective solution is to use a number of single or dual processor servers, either tower or rack mount. For larger systems, we recommend the IBM BladeCenterTM, which is more compact and easier to manage than a large number of standard servers. Mascot licensing is core based. For each licensed processor, Mascot will use 4 cores for searches. For a given architecture, search speed (or throughput) goes as the processor clock speed multiplied by the total number of cores. Only the processors used for searching require a Mascot licence. It is often a good idea not to run searches on the master (head) node of the cluster, but leave it free to run the web server, handle database updates, and generate reports. This makes the server very responsive even when there are several searches running, using all the processor time on the search nodes. Having a non-searching master node also gives you a spare node, in case one of the search nodes has a hardware failure. Result files are stored on the master node, so this needs access to plenty of disk storage. Search nodes only need local storage for program files and the compressed sequence database files; a single hard drive of modest size is usually sufficient. All nodes should have at least 2 GB RAM. The following examples illustrate some typical configurations. These can be nothing more than snapshots, since computer hardware changes so rapidly. We welcome the opportunity to configure a system to your exact requirements, using the latest and most cost effective components. The IBM Bladecenter S chassis uses standard office power, so does not have to be located in a purpose-built machine room. It has a capacity of 6 blade servers plus up to 12 hot-swap disk drives. In this example, one blade is the master node and the other five are search nodes. The IBM Bladecenter E chassis must be located in a purpose-built machine room. It has a capacity of 14 blade servers. In this example, the search nodes are housed in one or more BladeCenter chassis while a separate, standard server is used as the master node. This is more flexible and less expensive than configuring a blade to be the master. 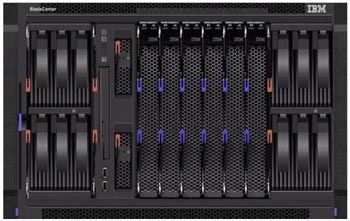 Up to 6 BladeCenters, (168 processors), can be fitted in an industry-standard 19" rack. The operating system can be either Microsoft Windows, (Vista, XP Professional, or Server 2003), Red Hat Linux, or Suse Linux. Unless specified otherwise, if you select Windows as the operating system, the web server will be Microsoft IIS. For a Linux cluster, we will install and configure Apache web server. Mascot Server is regularly updated as we add new functionality. Mascot updates need only be installed on the master node. Distribution of the program and database files to the search nodes is fully automatic, whether because of an update or because a node has been exchanged due to a hardware problem. Mascot administration tools provide web browser based system status reports. These are continuously updated and show at a glance important parameters such as processor usage and free disk space for each of the cluster nodes. As an option, critical alerts can also be sent to the system administrator by email. Mascot Cluster is shipped fully configured and soak-tested. Installation is performed by an experienced Matrix Science Engineer. The IBM hardware is covered by a 3-year, on-site, limited warranty for parts and labour, provided by IBM’s Global Services organization. Mascot Server software is covered by a 1-year warranty, providing access to expert technical support and free updates to all new releases of Mascot. You can continue receiving these benefits in subsequent years by purchasing a Mascot annual support contract. Mascot Cluster gives you maximum throughput in a reliable, compact and cost effective format. Please contact us to receive a quotation for a system tailored to your exact requirements. The IBM Business Partner emblem, IBM, eServer, and BladeCenter are trademarks of International Business Machines Corporation in the United States, other countries, or both. Download the IBM Business Partner Brief for Matrix Science, (requires Adobe Acrobat).